Millennials and Meal Kits: Will Dynamic Duo Shine in Supermarkets? Recently we learned that Walmart is planning to introduce prepared foods and meal kits to their stores nationally. This action is in response to an increased interest among Millennial shoppers for more convenient and higher quality, fresh ingredient meal solutions. Given Walmart’s massive size, the impact of this move could create more challenges for an already stressed restaurant marketplace and help trigger other supermarket companies to upgrade their own meal kit strategies, compounding the impact. Technomic reports business has slowed for the last two years at the nation’s top 500 restaurants. At casual chains like Olive Garden and Chili’s, growth went from an average 4.7 percent in 2015 to flat in 2017. 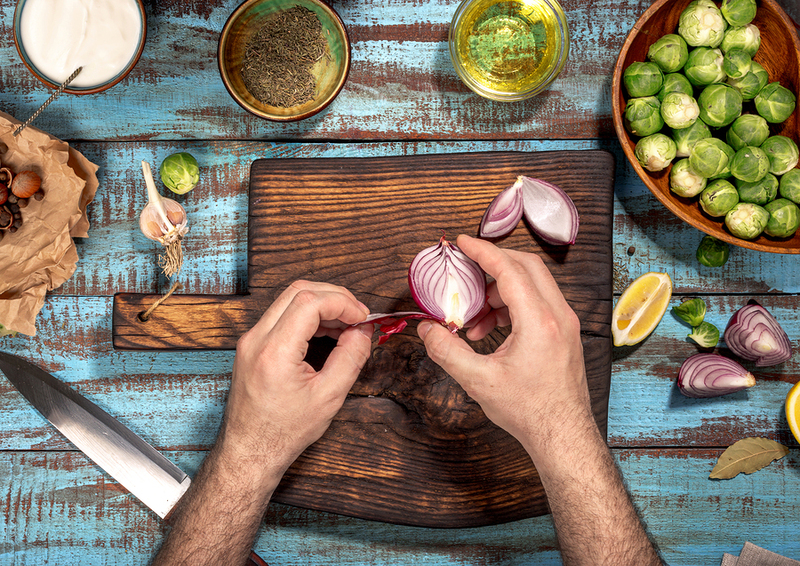 According to Port Washington, NY-based NPD Group, 83 percent of Millennial consumers report more cooking at home and fewer restaurant visits, while 63 percent of Millennials say they want to cook more. Concurrently the supermarket business is in the midst of transformation as Millennial shoppers flipped the script, causing a move away from traditional center store packaged foods, to shopping the perimeter departments for fresh, real food options. The fresh trend is seen as evidence of their preference for home prepared meals. Thus, also helping explain why legacy “big food” brands have seen their market shares decline in key packaged food categories over the last 10 years. 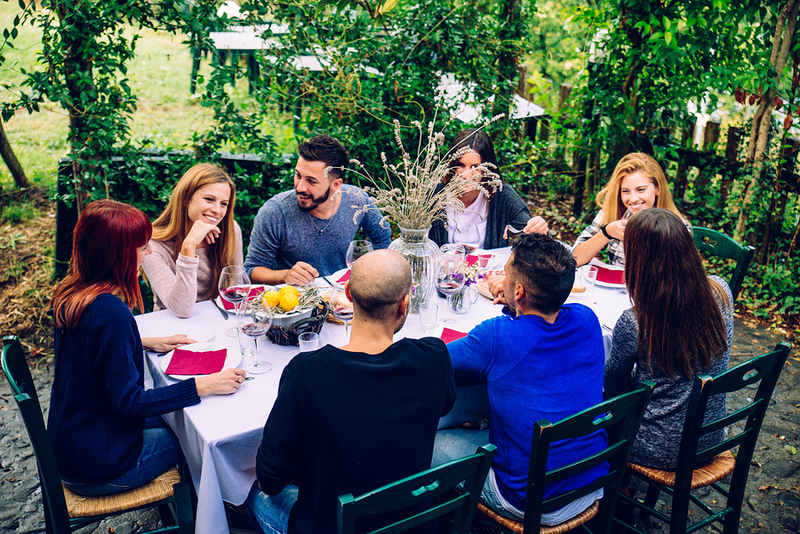 At the core of this behavior is a central theme: virtually all generation cohorts – from Boomers to Gen Z – have connected the dots between higher quality, real food experiences and desire for a healthier lifestyle. The interest in cooking at home is an outgrowth of efforts to assert greater control over ingredient quality, preparations and portion sizes along with the ability to better manage household food spending. At Emergent we see another explanation: the consumer’s love affair with food and culinary inspiration continues. The desire to exercise that creative calling in the kitchen is strong as it fulfills the number one driver for food purchase and consumption: healthy lifestyle. Consumers tacitly believe that home cooked food is healthier. Perhaps one of the most important, embedded features of meal kits is the ability to experiment with new cuisines and flavors at low risk and with ingredients already portioned and in some cases prepped. When dinner is now often decided at 5 pm the day of consumption, kits are an enticing just-in–time option to solve the meal need, without having to shop a 50,000 square foot store for five to seven items. It’s a form of high quality culinary convenience that meal kit companies like Albertson’s Plated brand often deliver with a backstory and ethos sitting underneath. Millennials passed Boomers in 2016 to become the largest domestic audience of shoppers, numbering some 75.4 million topping the Boomer generation’s previous lead of 74.9 million mouths. This generation has grown up with global cuisine; the rise of specialty food markets, locally-sourced ingredients, unique restaurant concepts, and even chef-driven bar food. It’s telling to note that fully 24 percent of the entire Millennial cohort shopped Whole Foods last year even though the chain has only 430 stores – a remarkable statement about their interest in higher quality food options. The meal kit business is symptomatic of larger changes looming ahead in food retail as e-commerce disintermediates the packaged foods category. As a result, supermarkets will be forced to redefine their models once built around selling those packaged products at volume to fuel the balance sheet. Emergent believes the future of food retail lies in mining culinary inspiration and food experience. Creating the Disneyland effect of “magic” around food adventure and the consumer’s interests in more innovative and interesting food solutions. Can the food enthusiastic grocery be far behind? The growth of groceraunt concepts will continue to gain ground as food retailers look to leverage their expanding commissary investments for meals to be consumed on site – yet another customer relationship building opportunity! We anticipate more supermarket jobs for classically-trained chefs as a result. Restaurants are entering a new era of innovation competition to more rapidly evolve menu boards and offerings that reflect the cutting edge shifts in tastes, new ingredients and food culture. Restaurants have always been the tip of the spear in new food trends that then trickle down into other channels in the food industry. 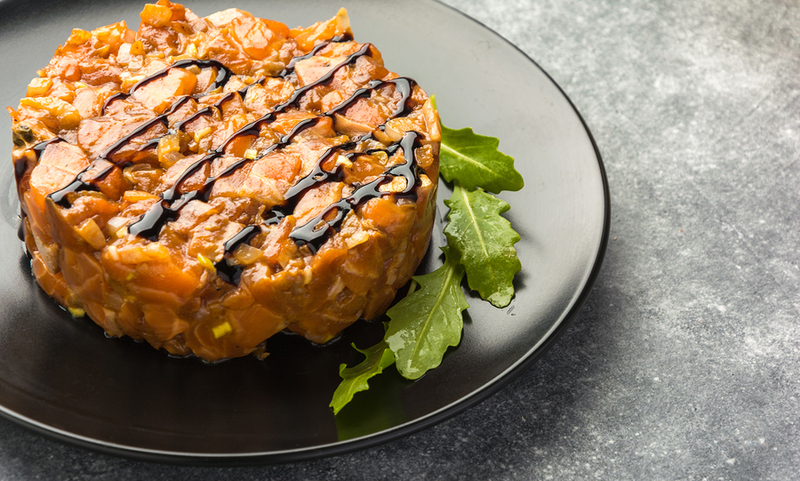 Now more than ever the call to action gains momentum for restaurant companies to explore tastes, preparations and ideas to stay ahead as supermarkets improve their fresh food quality, ingredient standards and Deli menus. It seems to us that restaurant companies also need to explore further the equity in their own brands to potentially create new signature food products that compete in other channels – much as Dunkin Donuts has done with their superb coffee line and Panera with their soups. Millennials’ enthusiasm for food and healthy lifestyle will continue to push grocers to earn their business by providing the quality, selection, and preparation options they want. Restaurants, while innovating on flavor and cuisine, may need to consider expanded channels as enhanced, food-enthusiastic food retailers vie for share of meal occasions. This may be the most exciting time ever to be in the food business! We believe that consumer insight should inform strategy. So we place a great premium around here on monitoring behaviors and cultural trends in the food business. Even more so now that food retail is at a crossroads with e-commerce accelerating rapidly to compete for more shopping occasions. Emergent recently examined a series of reports from the Food Marketing Institute and research company The Hartman Group, profiling shopping trends in the grocery retail business. We’ve identified 10 developments worth watching as the food retail business continues to transform amid the growth of consumer preference for higher quality, more authentic and real-food products. 1. Of millennials, 43 percent are now shopping online for groceries at least occasionally, up from 28 percent in 2016 – a 15-point climb in one year! 2. Most of this growth is coming from households that shop online routinely, and thus are already comfortable with e-commerce transactions. 3. Important to note millennials are more likely, however, to buy packaged products online rather than fresh and perishable items. 4. Gen-Xers with kids are more likely than other cohorts to actively use grocery store apps. 5. Millennials with kids are more likely to participate in grocery store social networks. They are apt to make judgments on the basis of ethics and sustainability practices. 7. Twenty-three percent of grocery shoppers claim to avoid GMOs, mostly for health related reasons, ‘naturalness’ and a desire to know exactly what’s in a product. 9. Seventy-six percent of grocery shoppers think a home-cooked meal is healthier than out of home meal options. 10. Households with kids have the highest adoption rates for retailer prepared meal solutions; two out of three households purchase them at least occasionally. Most impressive is the speed of change we’re observing in the food marketplace, and the need for retailers especially to work smarter. This is done by embedding uniqueness and differentiation in their banner brands, and creating immersive experiences for shoppers in both online and bricks and mortar environments. For retailers and CPGs still vying for transactions, it’s critical to realize that consumers have changed the rules. Those brands and banners that embrace connecting to shoppers in ways they find more helpful and meaningful will earn the business and their loyalty. More specifically, the path to consumer engagement is shifting and healthy lifestyle is driving this transformation. Emergent is a specialist in leveraging this insight to grow food businesses. We bring the latest insights and innovative strategies to help food businesses navigate the new consumer landscape. Bob Wheatley is the CEO of Chicago-based Emergent, the healthy living agency. Emergent provides integrated brand strategy, communications and insight solutions to emerging and established food, beverage, home and lifestyle companies. Emergent’s unique and proprietary transformation and growth focus helps organizations navigate, engage and leverage consumers’ desire for higher quality, healthier product or service experiences that mirror their desire for higher quality lifestyles. For more information, contact Bob@Emergent-Comm.com and follow on Twitter @BobWheatley. Emerging brands operate differently than legacy businesses. The path to market, to consumer interest and traction, is simply not the same as products with an established franchise in a category with deep roots. The emerging brand playbook is governed by a distinctive rule of engagement – one that reflects a shift in consumer food culture to place greater stock in product experience over marketing and messaging wizardry fueled by tonnage of media spend. Message to entrepreneurs who create new brands and large food companies seeking to acquire and scale them: put the traditional brand marketing game plan aside. Different rules prevail. What’s driving the importance of this conversation now? We are in the midst of a tectonic shift in the food and beverage business, favoring the growth and development of new independent brands that create their own distinctive categories. What’s going on here? Food culture shifts have run roughshod over businesses that at one time were stars in the food popularity contest – and rendered them less so. While new brands that integrate higher quality ingredients with deeper meaning and values, now take the lead in relevance to consumer desires. The consumer is clamoring for more unique, healthful, higher quality food experiences. As a result, the largest food companies seek to buy their way in to this sea change through strategic investments and acquisitions. The equity investment market for emerging food companies is robust as innovative disruptors move into fresh and packaged categories with new and adventurous solutions-with-an-ethos. These emerging brands live and grow by different imperatives than the ones generally thought to govern best practices in the CPG world. For the last 50 years, the brand-building rulebook has directed much of the thinking on marketing and communication: focused on creating equity and value in the brand. But this emerging business world is much different and requires a fresh approach that is mindful of how early adopter consumers seek out and become fans and followers of these rising star foods and beverages. Which comes first, brand or product? In the brave new world of nascent foods and beverages, it is the fundamental design of these products that imbues them with uniqueness and differentiation to the established, mainstream stalwarts. And it is this specialness in experience that puts momentum under their sales and adoption. This helps explain why emerging food and beverages that suffer from low to nearly no brand awareness thrive through their natural allure. The explanation for this is their systemic, beautifully curated connection to health and hedonic (indulgence) ideals and symbols now thriving in our food culture. In the packaged snack category Beanitos connects to emerging cultural preferences for nutrient and protein dense options. In this instance it’s the alternate carb base – beans – that forms the basis for its relevance and uniqueness. The symbolism creates its attraction: for smart, clever salty snackers. Rule #1 – Product Symbolism. It is the heart and soul of an emerging brand identity. The successful ones will connect directly, seamlessly with an up-and-coming insight into evolving food culture. Click here for our recent forecast on eight food culture trends impacting the growth of food and beverage businesses. Rule #2 – The Importance of Channel. Natural and specialty retail serve as incubators for these developing stars. Consumers shopping higher-end retail are already on the hunt for truly differentiated experiences. They bring a more informed approach to food exploration. Simply said, these shoppers EXPECT to encounter interesting, new products. Word to food retail: be the champion of these new experiences, and let food adventure inhabit your aisles. Rule #3 – Product-Focused Communication. You are working to build awareness of a differentiated product experience. Sensory trumps brand. The focus is on product news and backstory – ingredients, sourcing, recipe and mission/beliefs. 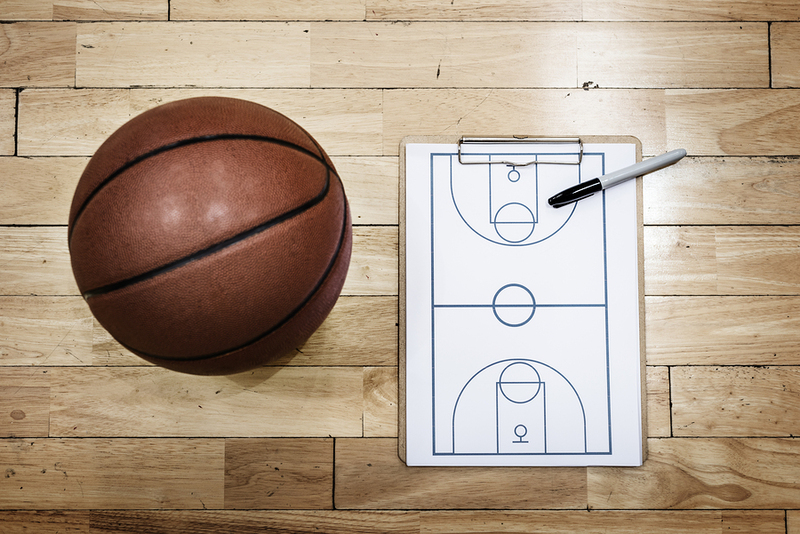 Learn more by reading Part 2 of The Emerging Brand Marketers’ Playbook. A new era of upgraded home cooking has arrived. 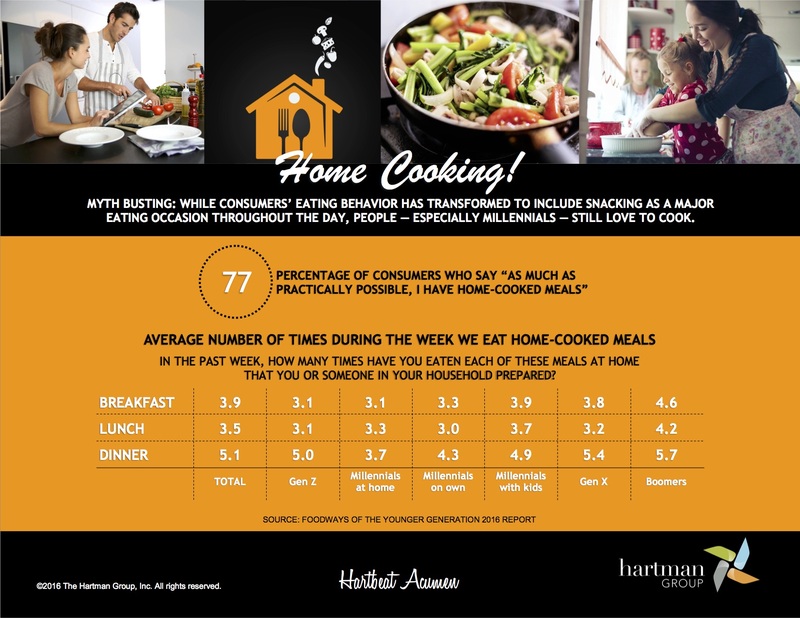 A recent infographic from the Hartman Group (shown above) reveals that 77% of consumers across various generational segments – from Millennial to Boomer – prefer having home cooked meals whenever possible.